The Best Books Ever: The Ghosting of Gods by Cricket Baker Review & $20 Amazon Giveaway! The Ghosting of Gods by Cricket Baker Review & $20 Amazon Giveaway! Jesse is an apprentice exorcist who defies his priests when he learns his sister is in danger even though she’s dead. When he’s exiled to a haunted world, Jesse must unravel the mystery of ghosts if he is to save her. He plunges into a deadly game of hide-and-seek. The players include denizens draped in monkish robes, ghosts with matted eyes, the dead who tunnel underground in terror, and...Elspeth. A coven scientist, Elspeth is both respected and feared for her abnormal spiritual powers. Jesse needs--craves--the knowledge of ghosts which she possesses. But is Elspeth a spiritual prodigy, or dangerously insane? The coven scientist begs him to trust her. He doesn’t. But he wants to. Caught in a world on the brink of spiritual evolution, Jesse struggles to understand Elspeth even as frightening contacts from his sister force him to face the secret, shattering meaning of a verse he knows well: Blessed are the poor in ghost. 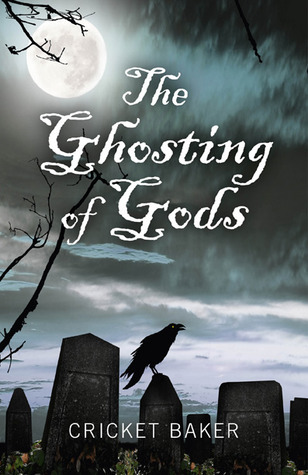 The Ghosting of Gods by Cricket Baker is an intriguing read. You are immediately dropped into Jesse's strange world. Honestly, for much of the story, I was utterly confused - not with the immediate moment, but with the bigger picture - which was a good thing. The plot twists and turns before coming to its epic conclusion. Jesse is a young exorcist who has questions that can only be answered in death. Unfortunately, he's not supposed to seek those answers, but reeling from the death of his sister (for which he blames himself), he continually searches. Aided by his friends, Poe, Ava Lily, and quirky little Leesel, Jesse enters a strange world where not is all that it seems. Cricket's narrative and world creation are both haunting and complete, albeit heavy. This is a dark, but enjoyable read. Her story is a blend of paranormal and spiritual in just the right amounts. I will say that her writing style takes my full concentration to understand, but I it was a pleasant escape from the normal straight-forward writing styles of so-many. It's enjoyable to have so much to think about. I was constantly immersed in Jesse's story and on this quest right along with him. As I said, I was mostly utterly confused, as is Jesse in his search for knowledge. The worlds Cricket created were so full of detail that I could imagine it all. I believe that's truly my favorite part of this book. The story was wonderful, but the visual detail just completely brought everything to life for me and I cannot wait to read more of her work! "I don't want faith. I want knowledge. And, I'll eat any forbidden fruit to get it." Please make sure you check out the book trailer on YouTube! Want to win a $20 Amazon Gift Card from the author? Enter below!